A few posts back I wondered if it was possible to create mashups of classic concerts. The Relix article is filled with writeups penned by a mix of musicians, music industry folk and rock writers as they recall some of their favorite and history’s most pivotal moments in live music. It has several surprises as picks for top concerts. And it was a collection that gave me a new perspective on what makes a concert a pivotal moment in live music history. I definitely had some “man, I wish I was there” feelings when I read about the Muddy Waters and B. B. King‘s Chicago blues concerts and Lollapalooza’s first tour in 1991. I’ve reread it several times because it’s a lot to soak up and think about, too. The overall focus is mainly on rock, pop and soul with no hip hop concerts mention at all, which is probably because hip hop isn’t one of Relix’s main genre focuses. Nonetheless what I enjoyed the most was the variety of perspectives and voices of the writers as I traveled through the piece soaking up the essence of each concert experience and its significance through the eyes of each writer. I should also mention that the group of writers Relix assembled was fun to read too because it’s rare that you get to read about the concert experiences as told by the musicians themselves. It was also refreshing to read because I got to experience the voices and read the work of new (to me) rock writers that I haven’t read before. Reading about 5o years of concerts in just the span of a few pages really sent me back to think about my own concert experiences. Which concerts would I pick? And why? Would I pick ones because of what they meant to me, or how they changed the world around me? 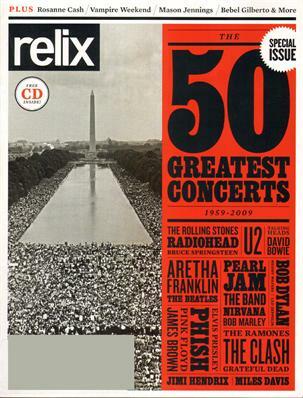 But what I enjoyed the most about the piece came at the end as I read the #1 pick: Washington Mall concert on August 28 1963 written by Relix Editor Josh Baron. It’s easy to remember Martin Luther King’s “I have a Dream” Speech that day but it’s easy to forget the role that live music had on that day as Mahalia Jackson, Joan Baez, Bob Dylan and others set the tone for the emotional peak that crowd would soar to that day as it was a pinnacle moment in the Civil Rights movement. Baron’s recount painted a great contextual picture of the “before” part of King’s speech that I’ve never heard about before. The moment comes after Mahalia Jackson led the crowd in a sing-a-long of “How I Got Over”. Ever since I read 50 Greatest Concerts I’ve wondered more about an important part of live music that I haven’t thought about in awhile: context and more specifically, what are the “before and after” moments that surround concerts, and how do those moments add meaning and significance to the concert itself? Are concerts simply great and historical because of what we experience ourselves, or is what happens “before and after” on larger cultural context what makes concerts “great”? Here’s a video of that captures some of Mahalia Jackson’s performance that day.